"Time punishes us by taking everything, but it also saves us—by taking everything."Gulp. “Nothing’s gone, not really. Everything that’s ever happened has left its little wound.” You will devour this book. Ongoingness is difficult to talk about, because the book is essentially a document talking about another document, so any review of it is a document talking about a document talking about a document. The farther one gets from the original document, the more abstract the whole thing becomes. I’ll do my best.Sarah Manguso kept a daily diary for many years; then she stopped keeping one. This book is about both of those things. 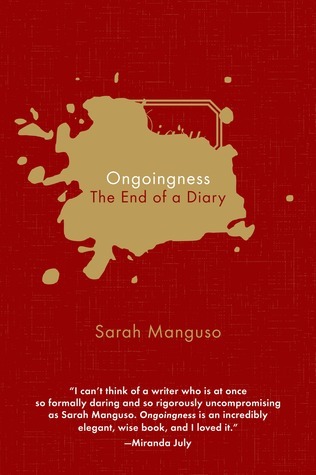 No excerpts from the diary are included--Ongoingness is simply about the issues keeping a diary raised for Manguso, and why she finally quit. Recording daily events was Manguso’s way of making sure that she was paying attention; that she was remembering things; that she wasn’t letting life pass her by. But you simply cannot record every element of your life; you pick and choose what to include and what to leave out, and thereby shape your memory and your past whether you mean to or not. And what of all those moments that don’t get included? Maybe things unrecorded and forgotten would have actually been more significant if they had been saved somehow instead of being lost. One thing that occurred to me is that all this time spent recording events and thoughts, and fretting over whether the recording is being done right, could prevent a person from actually living the life that’s in front of them. Strangely, this doesn’t seem to occur to Manguso, although many other things do.As for why she stops, I won’t give it away except to say that it was a bit unsatisfying for me, a bit heard-it-all-before, and at that point I began to get a little annoyed and started scribbling responses to Manguso in the margins. So oddly, when the book became less interesting to me is when I started having a more passionate response to it. I guess that’s a good thing.A warning: This book is extremely short. It’s about 90 smallish pages, and most of them contain only a paragraph—indeed, if the book hadn’t been laid out this way, it would probably have had too few pages to bind or sell. Beyond that, the form reminded me of Maggie Nelson’s Bluets in its apportioning of brief interconnected items.I wavered in my rating of Ongoingness. Ultimately, I think the book could have done more with the topic. There’s a bit of a “who cares” quality to reading about someone else’s diary-keeping when no attempt has been made to make the whole thing less insular. But I still find myself thinking about the book and turning it over in my head several days later, and that’s rare enough that it wins my respect. So short and spare it felt good to read in a day and write a review, adding to my "2017-read" list. But it's so unspecific in its language (definitely hurt my estimation of it that I read this after KOK's perfectly descriptive, world-evoking, utterly more animated and alive Autumn) -- and for a book about memory (always fertile ground for literary agrarianism) it underwhelms (let's just say that the patron saint of memory, Monsieur Proust, compares favorably to this). Pregnancy brain bits were interesting but, from experience, I know the phenomenon also applies to fathers, in that the brain cannot handle the accumulation of so much primary-colored plastic on the floor and having to wash all those sippy cups. Absolutely unlike William Gaddis's Bernhard-inspired Agapē Agape that also explores an enormous long-time project off stage (Gaddis's unpublished novel on the player piano). Maybe 9K words stretched over 92 spare pages, selling for $14 in paperback. Sheesh. Not worth it unless you want to get a little closer to your yearly reading-challenge number ASAP. Would've preferred to read the 8k-page memoir, although not if it's animated by the same spare expression and not particularly enlivening perception. If the unanalyzed life isn't worth living, a weakly analyzed life sure ain't worth reading: ". . . when your job is to think and write about yourself, the stakes start to appear artificially, comically high. And they must, for without them I wouldn't write at all. I'd spend the day reading the internet. I'd be half done by now." This tent definitely feels pitched on artificial, unnecessary stakes. I feel bad giving it two stars -- especially if the author ever gets around to reading this corner of the internet -- but it'd be rude to other books I've rated three stars to knock this up a bit for the sake of brevity. Beautiful book about writing diaries, memory, loss, motherhood and time. Profound but also slight and short, reminded me a little of Rebecca Solnit - will be reading more. Someday I might read about some of the moments I've forgotten, moments I've allowed myself to forget, that my brain was designed to forget, that I'll be glad to have forgotten and be glad to rediscover as writing. The experience is no longer experience. It is writing. I am still writing.Όντας μανιώδης καταγραφέας της καθημερινότητάς μου, όσο ευχάριστη ή δυσάρεστη κι αν τυχαίνει να είναι, όντας εμμονική στην αποτύπωση στο ημερολόγιο των μικρών και μεγάλων συμβάντων και της πρόσληψής τους, το συγκεκριμένο κείμενο ήταν απολύτως ταιριαστό με την ιδιοσυγκρασία μου. Η Manguso εκφράζει τους συλλογισμούς της για την τέχνη του να κρατάς ημερολόγιο, την ανάγκη να διατηρήσεις αναλλοίωτες, έστω στο χαρτί, ορισμένες αναμνήσεις, να αποδώσεις με τη γλώσσα τα όσα αποτελούν άυλους παράγοντες της ζωής, τη μνήμη στην καθαρότερη μορφή της. I didn't want to lose anything. That was my main problem. I couldn't face the end of a day without a record of everything that had ever happened.Παράλληλα η συγγραφέας διερευνά τις έννοιες της μητρότητας, με τη γέννηση του γιου της να είναι σταθμός στην ημερολογιακή ζωή της, και της θνητότητας, άρρηκτα συνδεδεμένη με τη μνήμη, προβληματίζεται με τη φθορά των αναμνήσεων στο χρόνο και τη μετατροπή τους σε περιληπτικά highlights αλλά και με τη σκέψη της συνέχειας.Soon after his mother died, my husband's dead father's best friend's ex-wife died. The best friend is the only one left. My husband said the man's name.That leaves him, my husband said. That leaves him, of the people who have known me since I was born. And then my childhood will be truly gone.Στον επίλογο η Manguso σχολιάζει με ειλικρίνεια την επιλογή της να μην παραθέσει αποσπάσματα ημερολογιακών της καταγραφών, γράφοντας I was afraid that if I read the diary, I'd have to change what I'd written about it from memory. And producing even those few thousand words had been so arduous, I couldn't bear the thought of having to rewrite them. But I was even more afraid of facing the artifact of the person I was in 1992 and 1997 and 2003 and so on. Time punishes us by taking everything, but it also saves us - by taking everything. I'm left a bit speechless. I couldn't stop reading, and I couldn't stop thinking "this is too much, you need to stop and think about some of these things". I could have written this book. Not in the way that people claim that anyone can write a book, but in the sense that every word of this book felt as true and as real to me as if I had written them myself. Forty pages in and tears were rolling down my cheeks because I felt like I understood myself better than I ever had before, understood life like I never had before. "I knew I was grown up when I spent time with them and felt not just the weight of my old memories but the weight of theirs, from when they were children. "The astonishingly brief time that we spend in this world, and how quickly we forget and are forgotten pained me. "My life which exists mostly in the memories of the people I've known, is deteriorating at the rate of physiological decay. A color, a sensation, the way someone said a single word—soon it will all be gone. In a hundred and fifty years no one alive will ever have known me. Being forgotten like that, entering that great and ongoing blank, seems more like death than death." The striving to remember always amazes me, because I spend so much time trying to forget. I'm a person who has kept a journal since I was a young girl, and I am convinced that to non-journal keepers, keeping a journal for long periods of time must feel like a Jedi Knight skill. It might well be, I don't know. I'm too close to the pages to be able to make an objective assessment. I know many people who struggle with keeping a journal, and personally I cannot imagine why they do. But then, I also cannot imagine why people who can read don't. All this means is a lack of imagination on my part maybe. I am a reader, and I am a journaler. Oh sure, we could use that lofty term "Writer", and it would apply, but why be so formal when we're among friends?Journalers write for all sorts of reasons, and I love reading published journals - May Sarton's for example are wonderful - so I was expecting to love this one. Alas, I did not. The author has kept a journal for twenty five years with this objective: "I wanted to end each day with a record of everything that had ever happened." Well, as those of us who keep journals know, that is a tall order indeed. This little book is not a published journal, it is more an essay on keeping a journal, and not even an essay, but a collection of very short musings on the topic.What I did like was that the author goes back and looks through all her entries, and in these musings meditates on her personal journey. There are some wonderful insights, and some well crafted sentences that are made me catch my breath, but overall, this one just left me wanting more. Here are the circumstances of reading Sarah Manguso’s Ongoingness: I am in a mega-reading rut. Nothing looks good. Everything takes too long. I’m tired of buying new books, but I’ve already read at least half of all of the olds. I finished a graphic novel and had to use Wikipedia like Cliff Notes to get a sense of what had happened. I sent a friend an email to ask what she was reading. Seemed like we would have similar taste, but different enough to not end up with a recommendation that I was already ignoring on a bookshelf.This is what she recommended; I finished it in two sittings. (It’s like a 100 pages, I’m no hero. )“The diary was my defence against waking up at the end of my life and realizing I’d missed it,” Manguso writes in what is essentially a love-hate letter to the on-going 800,000-ish word collection of memories.I can get behind that. I’ve been a journaler. High school me had notebooks teeming with the minutia of whose eye contact was held for how long. Thirty-something me put it all online, though the minutia was drinks drank and gas station burritos consumed. The idea of journals continues to plague me. I like reading them. I like reading about them. Heidi Julavits’ The Folded Clock was one of my favorite things to read last year. And I still have an unrealized Art-with-a-Big-A project I’d like to do myself involving my own journal (which is 2016 ceases to exist). So.In Manguso’s case, Ongoingness truly is: Let me tell you about what it feels like to keep a living record of everything that happens, without actually hearing much of the detail behind what has happened. I suppose that exists in her other books. I’ve just read one. The Guardians: An Elegy for a Friend is about a once-close friend who walked out of a hospital, did whatever for 10 hours, then threw himself in front of a train. I gave it two stars in 2012 and accused Manguso of being a Vaguebooker.This might be her signature. Ongoingness is the same, though it doesn’t suffer from it. Whereas diaries tend to be places of confession, the ode-to-the-diary-and-remembering has spare biographical deets: She’s kept a diary for many years. Occasionally someone has read it on the sly, but she gives no shits. She has a son who was born around the time her mother-in-law was dying. It is, otherwise, sentences like: “To write a diary is to make a series of choices about what to omit, what to forget. A memorable sandwich, an unmemorable flight of stairs” and a confession “Though I try to log only the first time that he does yet another extraordinary thing, the diary is now mostly about my son.”So this was good. I liked it. It's an unconventional pick. I’ve come around to Manguso’s style, though nosy me would like more grit, and I’m really curious enough to re-read her last book to see if my 2012 brain didn’t sync with what she was doing in a way that it might today. This also got me a bit revved about writing again, which good art does, I guess, huh. So, thanks, friend. Manguso's prose leans heavily on aphorism, rarely allowing anecdotes to spin out, bulge, or implode. Its neatness and reliance on interpretation rather than the description of events poses the book in stark contrast to the diaristic form, the aim of which, at least for Manguso, is to capture and store detail. The book’s subject is keeping a diary, and in its decision to never quote from Manguso's supposed 8000 page catalog of her life, becomes an anti-diary, an argument championing experience over cataloging and retrospection. Manguso devotes time to analyzing her own diary as a literary text. "In my twenties, I stopped to write every time I happened upon beauty," as opposed to passages from her thirties in which "most of the sentences started with verbs...Reflection disappeared almost completely" (54). The purpose and intention of the diary has changed, but more importantly, when is the last time you read your own diary and used its syntactic choices to psychoanalyze yourself? This is a fun and worthwhile game Manguso is playing. Though marketed as a memoir, it's really a book review of a book never published. I found this book shockingly short, given its subject matter. The author keeps an obsessively meticulous 800,000 word journal for 25 years, then writes a book about it that's only 100 or so pages long?The author was fixated on the need to document every detail of her life, and seemed terrified about the passing of time and the chance that she might forget something. I assumed she had some sort of mental disorder. I read on to discover what had finally allowed her to loosen her grip on the all-consuming need for remembering/documenting. I figured she had tried therapy or had a spiritual awakening of some sort. Nope. She had a baby. "I had no thoughts, no self-awareness, just an ability to sit with a little creature who screamed and screamed."Ugh. "One of the great solaces of my life is that I no longer need to wonder whether I'll have children."Bleh. At least it was a quick read. I love this book. It's a fast read and a brilliant meditation on time, and how we perceive ourselves in the present and the past. I'm at a place in my life where I feel like I'm constantly striving for something and this keeps me feeling vaguely unsettled much of the time. Manguso does a great job of addressing these feelings and how they shift and change over time. I felt like I was getting some wonderful advice from a mentor or an older sibling, but it didn't feel like a self help book. She invites us into her inner most thoughts and fears and draws wonderful conclusions about not making conclusions at all. Is it possible to have a favorite book of 2016 on the 5th day of the year? A book you want to gift to everyone you know, and one which makes you realize that you love your friends more for knowing they would appreciate it? This read like an essay version of Nayyirah Waheed's poetry. It is an unusual book in its content and its form, and one I treasured all the more for it. Beauty, beauty, beauty. Read this in a fever, and need to re-read it. Every section is so small, but so full. This little volume did nothing for me except think that the author was OCD. Manguso's fixation with memories is something I can relate to. (Though, I am not as passionate about it as she was.) I think maybe it is something all diarists tend to do. We record and record our days and thoughts. It is this longing to never forget or to always go back to a former self. Interesting in concept as an intellectual exercise, but not especially compelling as executed. What might have been an intriguing examination of and pushing of the limits of the written word as an analog of memory instead mostly demonstrates those limits by removing all of the ineffability of the best works (literature and otherwise) that take memory as their primary subject. It doesn't help that essentially the entire book necessitates being seen through a scrim of self absorption which, yes, should have been expected, but I also expected more distance; while Manguso is able to be a detached observer of her life, she seems less well-suited to be a detached observer of her observations. Ongoingness is a curious case, because it's obviously a deeply personal piece of work (albeit with some banal intersections with rather standard treatments with mortality and parenting), and a lack of personal interest on the part of the author is usually what drops a book's stock most in my eyes, but her personal interest isn't conveyed in a way that I could connect with at all; personal work, of course, need not be about anything that is interesting in any sort of objective way, but it does need to be about it in an interesting manner. While there's some default level of satisfaction in seeing someone puzzle something out for herself, this book is so tightly constructed that I found myself wishing that there was less overlap of her musings, even if that was the most accurate representation of her thought process. This latter complaint ties in somewhat too with perhaps my greatest disappointment, that being the relatively straightforward formal treatment of a subject matter (memory) that seems to demand formal innovation and experimentation. As I've gotten older and have more memories to remember, the subject of memory has become more interesting to me. This slim book/essay is about the author's relationship with keeping a diary; from the obsessive diary writing days of her 20s and 30s, to her more relaxed diary writing practices of today after the birth of her son.Early in the book Sarah writes...More than that, I wrote so I could say I was truly paying attention. Experience in itself wasn't enough. The diary was my defense against waking up at the end of my life realizing I'd missed it.And later, after the birth of her son she writes:And I'm forgetting everything. My goal now is to forget it all so that I'm clean for death. Just the vaguest memory of love, of participation in the great unity.I really enjoyed this exploration of time, memory, and record keeping. The sparse writing style reminded me a bit of Jenny Offill's Dept. of Speculation (also a wonderful read) and the subject of memory reminded me of The Sense of an Ending by Julian Barnes. I'm looking forward to reading something else by Sarah Manguso. I knew I worried about the passing of time a lot. But especially with reading, like being on goodreads and constantly cataloging pages and pages of things you have read or want to read- all of the time that goes into that reading, and then forgetting 3/4 of the book, what is the point? What is the point of ever reading a book you don't absolutely love? But I still do? And it becomes a weight on my chest. Like, I think I have been reading for the sake of reading in the same way that Manguso wrote in her diary for the sake of writing, so that it would be there. "The best thing about time passing is the privilege of running out of it, of watching the wave of mortality break over me and everyone I know. No more time, no more potential. The privilege of ruling things out. Finishing. Knowing I'm finished. And knowing time will go on without me." I feel this so hard, reading it was one of the biggest reliefs/affirmations of my entire life. It's probably really bad that I feel this way, and I'm scared that anxiety has killed any sort of healthy ambition. But anyways it's fine. I like the idea better than the result. This book disappointed me. The writing comes from the head. There is no sense of wonder. I have spent a lot of time journaling and thinking of how I perceive time (two things that drew me to this book) and while I didn't and don't expect how I do either of those two things to be shared by another person, I wish to see someone else's passion manifest--even if that passion is being dismantled. I expect to be taken seriously as a reader. My disappointment with this book was only matched by how much I had anticipated reading it. I think the proclivity toward obsessive documentation is interesting, especially when you put it in terms of a complicated relationship with time passing. I can relate to this, and that's what drew me to the book. But I can't relate to these metaphysical dilemmas being satisfactorily resolved by glorifying motherhood--an old story that holds no interest for me. YAWN. I really like this, but I have no idea how to review it. It's short. A bit poignant. Technically, an essay about time, sold in a book format. The book proceeds like a meditation on time, told in tiny chunks of introspection or epiphany by someone who's been preoccupied with time her entire life but who has finally, after becoming a parent, come to understand it enough to make peace with it. A very lyrical look at the ways we experience time and at our memory, and even at the meaning of writing. Intelligent and full of insights, it gave me a lot to think about, and I enjoyed it very much. I loved this, partially because I've been keeping diaries since 3rd grade, and because of its language and emotion. (if only my own diaries were this smart and poetic)My first of Manguso's books.must read her others. ..
Sarah Manguso - Sarah Manguso (b. 1974) is an American writer and poet. In 2007, she was awarded the Joseph Brodsky Rome Prize Fellowship in literature by the American Academy of Arts and Letters. Her memoir The Two Kinds of Decay (2008), was reviewed by the New York Times Sunday Book Review and named a 2008 "Best Nonfiction Book of the Year" by the San Francisco Chronicle.Her poems and prose have appeared in The American Poetry Review, The Believer, Boston Review, The London Review of Books, McSweeney’s, The New Republic, and The Paris Review, and twice in the Best American Poetry series. She was the Hodder Fellow in Poetry at Princeton in 2003–2004, and has been awarded fellowships at the Bread Loaf Writer's Conference, Yaddo, and MacDowell Colony, and a Pushcart Prize.She received her B.A. from Harvard University and her M.F.A. from the Iowa Writer's Workshop. She has taught creative writing at the Pratt Institute and in the graduate program at the New School, and currently teaches in the graduate program at Columbia University. She lives in Brooklyn.